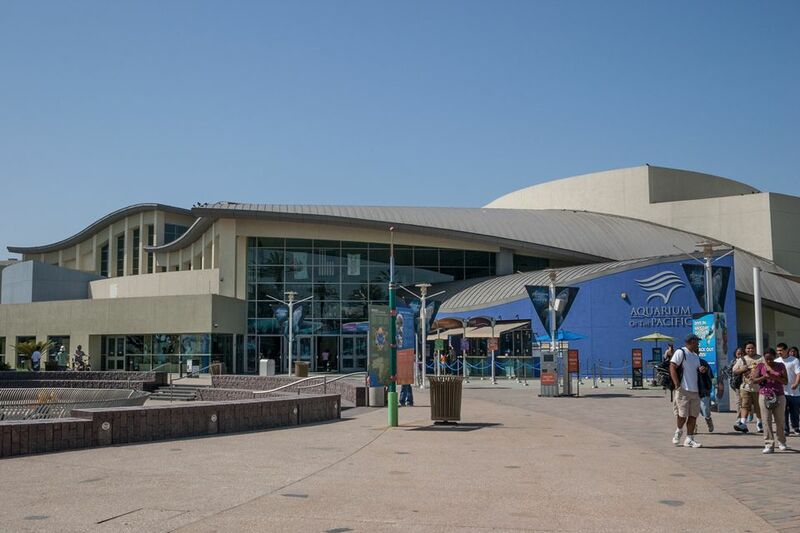 The Aquarium of the Pacific in Long Beach, California was voted by Parents.com as one of the 10 best aquariums for kids due to its extensive opportunities for children (and adults) to participate interactively in the learning experience. The distinctive wave-shaped roof of the Aquarium has been a landmark on Rainbow Harbor in Long Beach since 1998 ( no, NOT the round building with the whale mural - that's the Sports Arena). The Aquarium of the Pacific focuses on the marine life of the Pacific Ocean with over 12,500 specimens from 550 species in 156,000 square feet of exhibit space. And while it doesn't take you beneath our local waters, it does re-create the various undersea environments of the Pacific in exhibit tanks above ground. There's no "spectacle," but various birds, seals, and sea lions do perform, and kids are welcome to touch all sorts of creatures from sea urchins to zebra sharks. For bigger kids and adults, there are also some really cool behind-the-scenes tours and opportunities to interact with the animals. Daily handouts tell you when the scuba diver will be doing presentations from the Blue Cavern or Tropical Pacific Gallery and what other activities are scheduled. If you're not one to read all the interpretive panels, an adult can cover the public areas of the Aquarium in an hour. If you see a few shows or pay extra for tours, films or other activities, you can extend that a few hours. With kids, you could spend 2 hours or all day to have plenty of time for staring transfixed at the jellies, watching the sea lions and other shows and touching all the touchables. There are often themed festivals and special weekend events at the Aquarium of the Pacific that include additional entertainment and family activities. Hours: 9 am - 6 pm daily except Dec 25 and Long Beach Grand Prix weekend. The Watershed Exhibit is limited to school groups before 1 pm on weekdays. Ticket Prices: $29.95 Adults, $26.95 Seniors (62+), $17.95 Children 3-11 (check Goldstar.com for discount weekday tickets). See page 8 for more discount ticket options. Timed Tickets: During high season, you may have to buy a timed ticket to avoid overcrowding. Parking: There is a fee for parking at the Aquarium or anywhere near the Aquarium. There is discounted parking in the Aquarium parking structure with validation. Public Transportation: The Metro Blue Line stops a few blocks north of the Aquarium at the Long Beach Transit Mall. You can walk from there or take the Free red Passport Bus C that will drop you right in front of the Aquarium. The Aquarium of the Pacific is located in Long Beach near the end of the 710 Freeway. It is on the waterfront at Rainbow Harbor on Aquarium Way, off Shoreline Drive just across the Cyclone pedestrian bridge from The Pike entertainment complex and the Long Beach Convention Center. It is a short walk around Rainbow Harbor from the shops and restaurants at Shoreline Village. Harbor Tours, Whale Watching and Dolphin and Sea Life Cruises depart from the Rainbow Harbor near the Aquarium. This information was accurate at the time of publication. Please check the Aquarium website at www.aquariumofpacific.org for the most current information. The Aquarium of the Pacific has over 30 exhibits in 19 major habitats. The Southern California/Baja Exhibit includes the three-story 142,000 gallon Blue Cavern in the Great Hall, the 211,000 gallon indoor/outdoor Seal and Sea Lion Habitat, the Sea of Cortez gallery, the Ray Touch Pool, Shorebird Sanctuary and Wetlands exhibits and more. The Northern Pacific Gallery - Highlights include sea jellies, sea otters, and the giant Pacific octopus as well as diving birds like puffins and auklets. The Tropical Pacific Gallery with its Tropical Reef Habitat is the largest exhibit at the Aquarium of the Pacific with over 1000 colorful fish in 350,000 gallons of water that can be seen from three viewing locations. In addition to the diverse coral, kids will love the weedy sea dragon and Nemo and his clownfish friends. The latest addition is the frog exhibit. The Gulf of California Exhibit includes garden eels, balloonfish, Mexican lookdowns, Cortez rainbow wrasses, Cortez angelfish, yellowtail surgeonfish, and king angelfish along with information on how activities in Southern California affect what happens in the Gulf. The June Keyes Penguin Habitat lets you get nose to nose with a host of Magellanic Penguins. The Ocean Exploration Gallery presents the history of ocean exploration and discovery through photos, videos, art, films and special underwater exhibits. The Ocean Science Center features a variety of multimedia exhibits projected on a giant sphere to show the changes on the earth in various conditions. Explorer's Cove is an outdoor interactive exhibit space that includes the Shark Lagoon, the Lorikeet Forest, the Marine Life Theater and outdoor access to the Seal and Sea Lion Exhibit and the Penguin Exhibit. Shark Lagoon features 150 sharks you can touch and a few you can't. The Lorikeet Forest includes over 100 colorful rainbow lorikeets that you can feed with tiny cups of nectar. Beyond Explorer's Cove is the Our Watersheds: Pathway to the Pacific Exhibit including a California native plant garden and educational displays. The Southern California Steelhead Story near the Watershed Exhibit tells the story of the importance of the species in the Southern California ecosystem. The Molina Animal Care Center, a fully equipped veterinary hospital, opened in 2010, gives visitors a chance to observe veterinarians examining and treating aquarium or rescued sea animals brought to the aquarium. Interactive kiosks teach children about the work of the clinic when there is no actual activity taking place. The horseshoe crab touch pool and coral and sponge exhibit are located at the Animal Care Center. Several times a day, shades come down to darken the Great Hall of the Pacific and films are projected on eight screens high on the walls. Honda Theatre Films (10-12 minutes each) vary with new exhibits. The printed Visitors Guide provides a self-guided tour of the highlights of the Aquarium and stations where kids can have the guide stamped as they go. Self-Guided MP3 Audio Tours can be downloaded from the website. Guided tours of the Aquarium require a reservation and separate fee. Some tours require reservations at least a week in advance; others can be booked the same day. The daily schedule lists that day's available tours. Behind the Scene Tour - Provides a sneak peek at the daily operations of the Aquarium, taking guests into the "wet" areas and above the tanks. Children must be 7 and up, under 16 must be accompanied by an adult. Animal Encounters Tour - Two-hour experiences where guests get to learn about taking care of the animals and watch or participate in food preparation and feeding. Options include Sea Otters, Seals, and Sea Lions, or Sharks. Aquarium Adventures - A variety of special subject classes are offered for toddlers and pre-schoolers with their parents, school-age kids, and teens. The Aquarium of the Pacific offers a variety of special programs for children, families and adults from Aqua Tots activities for 2 and 3-year-olds, to family sleepovers, teen job shadowing and adult cocktail parties. Special programs are scheduled months in advance so check to see what may be on the calendar during your visit. The Aquarium of the Pacific hosts one or more themed festivals almost every month of the year. Some take place completely inside the Aquarium. Others spread out onto the lawn and around Rainbow Harbor. Festivals are usually included in the Aquarium admission price, and some outdoor activities may not require Aquarium admission. This information was accurate at the time of publication. Please check with the Aquarium to confirm specific events. The Visitor Information Desk is located right inside the entrance and has print guides in multiple languages. The Café Scuba Restaurant provides indoor, cafeteria-style dining including sustainable seafood on the second level with a view of the seal and sea lion exhibit. Bamboo Bistro outside in the Explorer's Cove offers pizza, hot dogs, beer and other refreshments. There is a Snack Bar in the Great Hall, and seasonally a snack stand is located on the Harbor Terrace through the glass doors off the Great Hall. Pacific Collections Gift Shop is located just inside the main entrance. Amazing Pictures provides an opportunity to purchase souvenir photos. There are Restrooms with baby-changing facilities in both the Women's and Men's rooms on the first floor near the central elevator inside the Aquarium, with a baby-care station in the first floor women's restroom. The second floor unisex restroom also has a baby changing table. Another restroom is located near the Shark Lagoon outside. Elevators are located near the center right side of the Aquarium (from the entrance) and in the back, to the left of the two-story Blue Cavern tank. Online Discount: Tickets purchased online are discounted from the gate price. Military Discount: Active military can get discount tickets from their local MWR office. Veterans Discount: Veterans, military personnel, police officers, and firefighters who show valid service ID receive free admission on Veterans Day. Check Goldstar.com for half price tickets for weekday visits. Aquarium admission is included in the Go Los Angeles Card.